If any other show tried to have a season premiere that spanned three weeks, it would probably fail miserably. But Brooklyn Nine-Nine has been killing it with Greg and Larry’s adventures down in Florida. Last week saw the duo land in jail, escape from jail, and finally call in the Nine-Nine for help. Now, Greg and Larry are on the run as they try to evade both the sheriff and Jimmy Figgis while they wait for their team to come rescue them. They make their way to a gas station to pick up some food, but their faces are plastered all over the news and the cashier recognizes them so they have to make a run for it. They jump a fence and land in a pile of garbage. 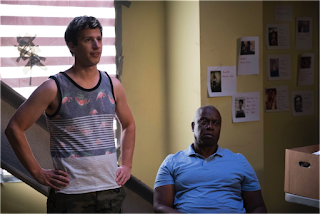 While Jake bemoans the fact that his leg got all scratched up from the fence, Holt casually mentions that he fell on a metal pipe which is now sticking through his leg. Meanwhile, the team is packing their bags for Florida. Captain CJ still won’t give them permission to go, but they’re not going to let that stop them. Unfortunately, there were no plane tickets available at the last minute so they’re road-tripping it down to Florida. While the team makes their way, all crammed into Terry’s van, Jake and Holt prepare to remove the metal pipe from Holt’s leg. Jake breaks into a vet clinic to get some medical supplies but is far too queasy at the sight of Holt’s wound to patch him up. Holt takes matters into his own hands, pulling the pipe out and patching himself up while calming Jake down by keeping him talking. Jake shares his fears that things will be weird between him and Amy now because it’s been so long since they’ve seen each other. Holt, while sewing his own wound shut, reassures him that everything will be magical when they meet. The next morning as Jake is relaying his failed attempt at getting breakfast for them to Holt, they hear noises outside their storage facility unit. The only weapon they have is the pipe that was pulled out of Holt’s leg. Jake arms himself with it and prepares to attack whoever is on the other side of the door. It turns out it’s just the team, and Amy accidentally punches Jake in the throat during the commotion. Jake lets them in on the plan: they’ll lure Figgis to the FunZone. They decide Holt should stay in the storage facility since he’s injured. Gina offers to stay there with him. She has procured a gun from a rest stop vending machine but since she’s unlicensed and still coming off her Ambien coma from the road trip, they take her gun away. The team prepares the FunZone for the impending attack, but Amy and Jake have bigger worries: things are super awkward between them. They can’t figure out why and they keep accidentally injuring each other. Just as they have some time to talk about it, Figgis and his men arrive. The team takes out the goons, and Jake goes after Figgis himself. He manages to get Figgis cornered but then the sheriff shows up. He’s tracked Jake to the FunZone and is prepared to take him back to jail by any means necessary. Jake tries to explain again that he’s an NYPD detective and that Figgis is a big, bad, mob boss, but the sheriff still doesn’t believe him. During the argument, Figgis manages to shoot the sheriff and take Jake hostage. The team has managed to take down all of Figgis’ men but now they’re busy with the sheriff’s men. They’re finally able to disentangle themselves and Amy runs after Jake and Figgis. Figgis is holding a gun to Jake’s head but Amy creates a diversion by shooting Jake in the leg, which thoroughly confuses Figgis, who then releases Jake and makes a run for it. Just as Figgis is escaping in his car, Holt and Gina appear, driving a huge truck. They were tired of waiting around and missing all the action so they procured the truck at the storage facility and got there just in time. Gina also managed to get another gun, this time from the storage facility’s lost and found. As Figgis is being led away, Jake and Amy discover that they’re back in sync now. The sheriff will live and is super pumped about the possibility of getting disability for life. I guess that’s the best you can hope for in Florida. It turns out Marshal Haas is also fine – she’s been discovered at Figgis’ hideout unharmed. Back at the precinct the team faces Captain CJ, who says he understands they did what they had to do to rescue their friends, but they still disobeyed him and now he’ll exact his revenge: night shift duty for the whole team for the rest of forever. I don’t know how long it’ll be before Captain Holt gets reinstated and Captain CJ’s kicked to the curb, but I hope it takes at least a couple episodes because it’s going to be fun to see the whole squad stuck on the night shift. 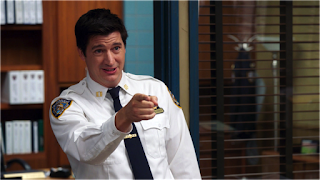 I’m envisioning a lot of pajama parties, popcorn, and movie marathons in the Nine-Nine’s foreseeable future.